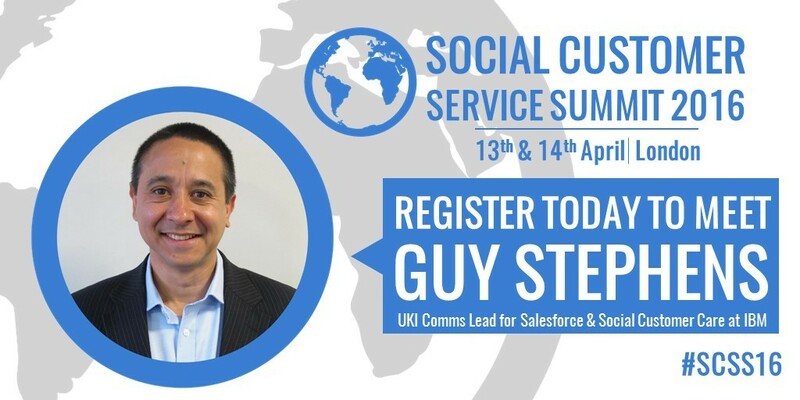 In the run-up to our 3rd edition of Social Customer Service Summit we are distilling some thoughts, tips and insights from our expert speakers to preview their sessions on 13th of April. This week we posed some future-gazing questions to Guy Stephens, the respected social customer care consultant, currently of IBM. 1) The theme for SCSS16 is ‘Integrating Social Media into Your Omni-channel Customer Service Strategy’. To what extent do you see this integration happening in the industry today? Integration is definitely happening. It’s a natural progression of where the social customer care journey has got to. Back in 2008 social customer care was essentially a parallel stream, with companies waiting to see how it would evolve or whether it would even be around. By 2014, as more and more companies offered Twitter and Facebook as legitimate channels, we’ve seen the inevitable integration of them take place alongside their traditional counterparts. I think the next inevitable integration wave is going to see Instant Messaging, video chat, and in time more analytical functionality native to the platforms themselves, particularly around predictive or pre-emptive modelling and next best action. Whether ‘social customer care’ as a label continues is a moot point, as the next iteration of ‘customer service’ evolves over the coming years. 2) To date, there’s been a lot of emphasis on the scalability of social customer service. Do you consider scaling up to be a major challenge facing brands? I think we need to think about ‘scale’ or ‘industrialising’ social customer care in a different way. Scale is a key component of a delivery model that drives or strives for consistency, delivering the same level of service by any number of agents, interaction after interaction. Scale seeks to reduce things to a level of homogeneity that potentially strips each interaction of its personality and empathy, reducing the experience to a linear operational process that can only ever move towards an inevitable resolution: the company is always right. Keeping the company ‘right’ is done through strict governance and measuring the minutiae of operational efficiency. This is often at odds with social customer care, which for the last few years has sat outside of this ‘traditional’ model, but as the social and traditional channels become increasingly integrated, the likelihood, and we are already seeing this, is that social will be shoe-horned into a traditional cost-driven model. My belief is that we need to think of scale as a mindset or culture, and rather than setting prescriptive policies, we need to give agents a ‘freedom within a framework’ approach. An approach where the mindset or culture can be scaled, where the appropriate guidelines and metrics that allow this to happen can co-exist. 3) There seems to be a shift happening away from social customer service towards 1:1 private messaging. Is that something you’ve noticed? Do you think it’s good for brands? And customers? I’ve definitely noticed the increasing ubiquity of IM over the last year or so. And if you look to somewhere like the Middle East, they have been using WhatsApp or Snapchat for customer service a lot longer than we have in the UK. I don’t necessarily think there’s a shift away from social customer care. Whenever something new comes along, the assumption is that it will replace something that exists. Typically, it just gets added into the mix. When Twitter came in, people thought it would replace the contact centre. The contact centre is still around. The contact centre will likely evolve over the coming few years into something that is more relevant to the changes that are taking place today. Is private messaging good for brands? I don’t think it’s good or bad. It offers brands an opportunity to engage with customers, and the challenge brands have to recognise is not only the unique characteristics of private messaging, but also to respect how their customers are using it. Is private messaging good for customers? Once again, in my opinion, it’s not a ‘good’ or ‘bad’ thing. It’s simply what customers are using. Customers are showing brands how they are using it. It’s up to brands to understand this. 4) What are the most interesting innovations or developments you’ve seen in social CS in recent months? I think what’s interesting now is that you’re seeing another play start to unfold. Facebook and Twitter are recognising their increasing value as a platform and creating customer service offerings on top for both people and businesses to use. The question is to what degree Facebook and Twitter themselves will recognise the customer service opportunity and either offer integration points to other platforms, or continue to develop customer service offerings. Might these ‘platforms’ be the start of what the next service model looks like? I think we’re also seeing the start of what you might call ‘cognitive service’ with companies like Google, IBM and Salesforce. A type of service where analytics, machine learning and artificial intelligence is an integral part of the tooling itself. This together with the Internet of Things, could fundamentally change the way service is provided. It is still very early days though! Register today to hear more insights from leading brands and industry experts.